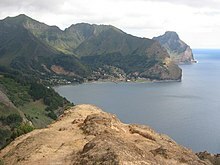 Robinson Crusoe Island is the largest of three islands in the Juan Fernández archipelago, belonging to Chile. The island is also known as Isla Más a Tierra or Aguas Buenas. More than 800 people live on the island, which is 672 km (418 mi) from the coast of South America. In 1966, Chile renamed it Robinson Crusoe Island, because Alexander Selkirk had spent about four years alone there. Selkirk may have been the person who inspired Daniel Defoe to write the book Robinson Crusoe. This page was last changed on 27 September 2016, at 04:29.